PaperSeven’s Blackwood Crossing starts out as a deceptively simple tale that becomes more and more surreal as it careens toward an eye-opening finish. Scarlett, the freckled, red-headed protagonist, wakes up on a train where she is both charmed and harried by her fidgety brother Finn. 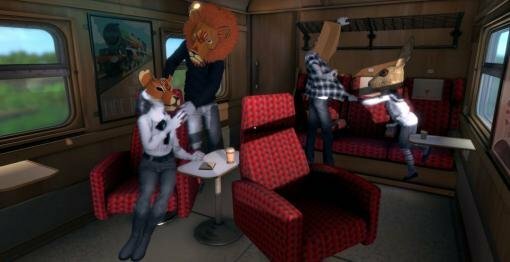 The siblings soon meet other passengers wearing cardboard masks that they begin to identify as family, friends and enemies. Why Finn and Scarlett are on this journey and what their ultimate destination will be are deeply-held mysteries. Just as you begin to get a handle on the character relationships, the train suddenly becomes carpeted with grass and flowers, a ladder leading up to even more dream-like locales. These new scenes provide glimpses into the past as Scarlett desperately seeks to resolve a tragedy that shadows them all – especially the engaging, impulsive Finn. Rather than relying on lengthy exposition, dialogues here are succinct but relatable, concisely yet impressively touching on past conflicts and escalated events. As more is revealed, plot tidbits are fused into a narrative that continually teases, grips, and then confounds throughout the game’s tightly-focused four-hour play time. The bizarre situations and fanciful scenarios encountered begin to evoke emotions that become achingly real. Players must gradually come to terms with what the main characters can accomplish and are forced to accept – including when to hold on and when to let go. For keeping us guessing and then tugging at our heartstrings as the light of realization dawns, Blackwood Crossing poignantly snags our best dramatic writing Aggie for 2017. 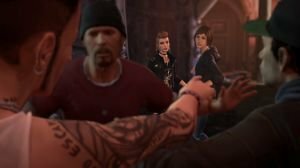 Videogames haven’t historically been the purview of Young Adult fiction, but that changed in a big way in 2016 with Life Is Strange, an emotionally-charged episodic adventure that beautifully depicted the unlikely friendship of two teen girls against a surreal backdrop of paranormal events and impending disaster. For a follow-up, publisher Square Enix turned to a new developer, Deck Nine Games, for a three-part prequel telling the origin story of Chloe Price and her best friend Rachel Amber, whose mysterious disappearance was one of the original story’s central mysteries. Easing up significantly on the supernatural slant, Before the Storm focuses almost exclusively on the girls’ burgeoning relationship. At times sweetly moving, at times age-appropriately dramatic, the coming-of-age story didn’t quite reach the heights of its acclaimed predecessor, but the very personal, often authentic-sounding script was more than enough to easily take home the readers’ choice award. Next up: Best Character... the envelope, please!